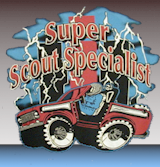 Site Images and Content Copyright Super Scout Specialists Inc. All rights Reserved. The IH logo, the "Triple Diamond" logo, Scout, Traveler, Terra and Travelall are trademarks of Navistar, International Truck & Engine Corporation. Their use has been licensed under Scout Light Line Distributors, Inc.
Site design Copyright Colliding Star Productions, LTD. All rights Reserved.